« Roger Rabbit is back! Update: June Foray, legendary actress famous for giving a voice to numerous cartoon characters, passed away June 26, 2017. I had the pleasure (as “Mickey”) of hosting an online chat with her along with help from my friend Melanie Ross (EntertainMuck’s “Alice”) who was alongside Ms. Foray during the interview and typed in her replies and comments as June said them. EntertainMuck’s lar3ry and I appreciate her efforts in getting June available for our little group. This is a transcript of a special invited online talk. The chat occurred on Saturday 8 August 1998 at 10 PM U.S. CDT (GMT -0500) at the Arbordale Auditorium on AmberThree Productions’ EntertainMuck (http://www.emuck.com, telnet://game.emuck.com:6903). This transcript logs only the questions asked to Ms. Foray (JuneForay), comments from moderator Rich “Mickey” Koster, and assorted opening and closing comments. Audience comments during the talk are not generally included. While June Foray has affiliations with The Walt Disney Company, she is not visiting this chat as an Official Representative of TWDC. Any and all comments stated here are solely the opinions and experiences of Ms. Foray and do not necessarily reflect the policies of TWDC. Special Invited Talks with celebrity guests take place in this large auditorium. Ms. June Foray is best known for her work as Bullwinkle’s pal, Rocky the Flying Squirrel, although she’s done hundreds of cartoon voices: Nell Fenwick, Dudley Do-Right’s girl; Natasha Fatale, Boris Badenov’s partner-in-crime; and most recently the voice of Grandmother Fa in Disney’s “Mulan” animated feature, just to name a few. For more info, see (updated link) using your web browser. This chat with Ms. June Foray takes place Saturday, 8/8, at 8 PM Pacific time / 10 PM Central time / 11 PM Eastern time. > To ask a question of anyone at the podium, enter ‘REQUEST’ (without quotes) and wait to be prompted to enter your question. Your REQUESTed question can be longer than one line – Just wait to press your Enter key until after you finish typing your question (not at the end of *each* line). Many questions may be in the REQUEST queue ahead of yours, so please be patient. No one at the podium can hear what is said in this room so use REQUEST for questions. ANNOUNCE> (Mickey) Tonight’s Special Invited Talk with Ms. June Foray, voice of Rocky the Flying Squirrel and hundreds of others, will begin in about 10 minutes. If you aren’t already in the auditorium, come on in now by typing “run welcome;june” without the quotes. >< Mickey grins and is glad, too! ANNOUNCE> (Mickey) We’ll begin tonight’s special chat with Ms. June Foray in about 5 minutes. If you aren’t already in the auditorium, type “run welcome;June” without quotes to join us now. >< Mickey hands June a Mouseke-cola. Mickey grins at JuneForay and wiggles his nose. As it jiggles up and down, his big mousie ears wiggle-waggle! Mickey adjusts his mouse-eared moderator hat and prepares to start tonight’s chat Special Invited Talk. Mickey takes the Mouse-Eared Moderator Hat and puts it on, smiling as he senses it fits him! ANNOUNCE> (Mickey) The Special Invited Talk with our special guest, Ms. June Foray, will now begin in the Arbordale Auditorium. Type ‘run welcome;June’ without quotes to get there if you’re not already in the Auditorium. >< Mickey gulps for breath and then says, “Hokeysmoke! What a mouthful! And now, let’s begin the chat. June, are you ready? >< (Timon) I’m interested in becoming a voice actor. How would I get started on my way to becoming one? >< (Bashful) June, tell us about your association with Stan Freberg. I have a CD set of his ’57 radio show, and I tiink you did some funny stuff in it. My favorite sketch of his was the Dragnet one. Beleive me, I got it straight from the dragon’s mouth! >< (guest4) How does one get an agent? >< (g.PonsonbyBrit) Which are some good agents… Don Pitts?… etc? >< (Bashful) ‘You worked with the late Bill scott, first on the Bullwinkle show, and then in Gummi Bears. Do you consider this association with him to be unforgettable? >< (Beast) Were the writers of Rocky & Bullwinkle making it up as they went? What were they smoking? That’s some of the most wonderful, madcap humor ever penned. Do you have any tales or insights into the creative process that gave us R&B? >< (CzarJim) Rocky and Bullwinkle had a lot of wonderful multi-level humor – it was great for both adults and children. Was the conscious in the writing? Was there an ongoing attempt to entertain the parents and the children? >< Mickey watches Meecelet put more ice and bubbily into June’s glass. >< (Rufus) I see that one of the Annies is called the “June Foray Award”. What’s that and why you? >< Mickey knows someone right next to you who has some for sale, too. >< Mickey winks and waves at Alice. >< (g.Fred) Can you tell us how you founded ASIFA, what that’s about and how they are doing these days? >< (Rufus) I couldn’t find a complete filmography of your work anywhere. Do you think there is one in print or on the web? >< (Rufus) Just how many voices do you have inside there, anyway? >< (Alice) Do you get videotapes of all cartoon episodes you’re in? Or, do you tape the shows from T.V.? >< (Alice) What do you feel is the most challenging aspect of voiceover work? >< (Belle) from SunniGummi: did you enjoy working with Bill Scott with his production company and Disney? >< JuneForay giggles with Mickey. >< (SunniGummi) Which show that you worked on from Disney, did you enjoy the most? >< Mickey watches Meecelet exchange the Mouseke-cola for Gummiberri juice in June’s glass. >< (Belle) Can you tell us about any memorable moments in making Mulan? >< (Bashful) June, how was it to work with Ming-Na Wen? Was she nice? >< (SunniGummi) Gummi Bears is one of my favorite shows. Did you enjoy working on that series? >< JuneForay gives a puzzled look. >< Mickey thanks Alice for the correction. >< (Alice) What would you say is the most important skill necessary for success in animated voiceover work? >< (Alice) Is there a Character you would like to give voice to, but haven’t? Who? >< (Sally) What is your favorite part about animation? Or rather, about BEING an animated character? >< Mickey hears Alice laughing as June does the voice for her! >< (SunniGummi) Was there a voice that you had trouble doing? >< Mickey giggles and Alice faints! >< (Clarice) What do you think of the current crop of voice artists in relation to artists past? >< (Wuntvor) What other voice talent was the funnest to work with and why? >< (g.Prismo) Which vocal exercises would you consider the most important for your work? >< (SunniGummi) How was it to work with the late, great Mel Blanc? >< (g.Fred) How many recording sessions for the Granny in Mulan… 5? >< (Bashful) June, I read somewhere that General Mills, the sponsor of Bullwinkle, tried to stop the counterfeit box-top episode. Do you recall this incident? >< (Bashful) Where did the fake name Ponsonby Britt come from? >< (guest4) How is today’s voice acting different from when it initially started? >< JuneForay laughs with Mickey. >< (MissSawyer) How old do you have to be to be a voice artist? >< (Tahamaki) What voice artists do you personally feel were mentors to you? >< (guest4) Did you ever take part in the concerts at the Dudley Do-Right Emporium? >< (guest4) Yes, Jay Ward had concerts in the parking lot. >< (Wuntvor) Can you tell us more about the “live recording” system that was used for R&B? >< (g.Peabody) Did you work close with Hans Conried too? >< Mickey likes that one! >< (Bashful) I noticed in the R&B credits that Gerard Baldwin was one of the animators. He was later the director of Smurfs. Do you know Mr. Baldwin? >< (Bashful) I eat Cheerios all the time. Tell me about some of the commercials you did. >< (guest4) Do you know of any mentoring programs available to women in animation? >< JuneForay doesn’t know of any mentoring programs for women in animation. >< (AmericanMouse) Is there going to be any new Rocky and Bullwinkle cartoons made? >< (Beast) You have worked on a few endeavors with the Disney company. How do those experiences compare with working on Rocky & Bullwinkle? Is there a marked difference between the corporate approach of a giant like Disney and a less “mainstream” project like R&B? >< (Rufus) Much of your early work was in live radio, and you still praise the R&B show for simultaneous recording. How much do you credit this background for your success and the spontaneity of your characters? >< (Bashful) June, what is your favorite Disney animated feature? I love Beauty and the Beast. >< (SunniGummi) Not a question, but a comment: I saw Mulan recently and thought your performance was terrific. >< Mickey thinks so, too! >< Mickey grins and remembers June’s famous lines about a rabbit and a hat, as Rocky. >< (Bashful) Getting back to Freberg’s radio show, I know Daws Butler is gone. Whatever happened to Peter Leeds, Jud Conlan, the singer Peggy Taylor, and the announcer Bud Soule? Were you friends with them? >< (Wuntvor) Do you have any young relatives that you see often and they always ask you to do “that” voice? What voice is it? >< (Beast) In one of the episodes of Dudley Do-Right, the words “Far Above Cayuga’s Waters” appear. Do you know what the writers intended that to refer to? Is it a reference to Cornell University’s song? If so, why? Does it relate to the old-time film studio that was once in Ithaca, NY? >< (SunniGummi) ms Foray, I enjoyed your work on Gummi Bears. Do you remember any stories while in the recording studio doing your voice of Grammi? >< (g.tweener) Hi! What do you think of this internet and alla us here mm? hehee! >< (g.tweener) OH! and do you have any plans for internet work or recreation? >< (guest5) Given the near-demise of Saturday morning cartoon blocks, do you think children in the future will have lesser appreciation for classic cartoons like R&B, the WB cartoons, Disney, etc.? >< (guest4) Did you do any voices on Tom Slick? >< (Gusto) What is your impression of Rob Paulsen, voice of Gusto on Disney’s Gummi Bears? >< (SunniGummi) Did you have trouble doing the name of the baby sitting service that was used in The Simpsons? >< Mickey grabs a straw hat and cane that are thrown to him by Meecelet! >< Mickey starts a soft-shoe dance. >< Mickey grins and his big mousie ears go wiggle-waggle. >< Mickey grins and wonders if he should shoot the audience with his water pistols like Wally used to do. >< Alice is ushered onstage by a gorilla in a bad-fitting tuxedo, who then hurries back to guard the Stage Door. >< Alice smiles at June as she leaves! Mickey comes down into the main part of the Arbordale Auditorium from the stage and podium. Plush Beast eeps a plush eep. Double_D picks up the stenographic camera along with its keyboard. you like to “wear” them? You put on the Air Forays and fly around the room like Rocky! SunniGummi puts on the Air Forays and flies around the room like Rocky! Plush Beast eeps a loud plush eep! Briar_Rose arrives at a breathtaking pace. Plush Beast holds out his plush paws to Briar Rose, hoping either to be picked up and huggled, or fed. Mickey changes back into his classic attire of red shorts and big yellow shoes. Belle is envious of Alice for meeting June Foray. Plush Beast eats the Snacks out of Briar Rose’s hand! His plush whispers tickle her palms as he feeds. Magus would LOVE to meet her. Rufus has met a number of stars, but few are actually nice people. At least she didn’t succeed. g.tweener (pool027-max4.ds8-ca-us.dialup.earthlink.net) chuckles at Mickey. Double_D is stopping his log..brb. g.tweener (pool027-max4.ds8-ca-us.dialup.earthlink.net) buys you a generator! Plush Beast eeps a plush eep at Briar Rose. With a tear in your eye… and a thump in your heart… you go home. In the late-90s, I was blessed with an amazing opportunity to interview this unbelievably talented yet charming and totally down-to-earth treasure of a person. When I asked where she’d like to meet, I fully expected she’d indicate a studio or a restaurant or some such. “Don’t be silly,” she cheerfully tossed, as if we’d been lifelong friends; “C’mon over to my place!” and she gave me her home address in the Valley. June (“Oh, just call me June!”) graciously answered questions posed by me and by Disney fans across the nation who were texting their questions to me real-time on my Apple PowerBook 1400. Keep in mind, this was prolly in ’98 or so–long before today’s wifi and high-speed tech. June brewed up a pot of coffee for us as she patiently awaited and answered each question, despite likely having answered identical queries from other writers over and over for decades. Her fresh and candid replies coupled with her eager willingness to take even more questions truly impressed and humbled me. When the interview was done, she invited me to close up that computer and just chat. And we did. We had a thoroughly delightful visit for another 30-40 mins. And it indeed felt like I was reconnecting with an old, dear friend. Today’s news of June’s passing caused my spirit to suddenly plunge into a void…but I also instantly recalled the precious memory I have of my evening with June…and my spirit is set dancing once more. 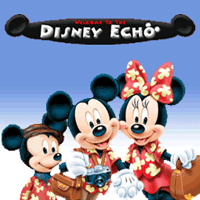 My heartfelt thanks to Richard Koster and the Disney Echo for helping make that opportunity of a lifetime come true.